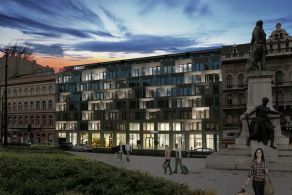 DVM group signed a contract with German developer B&L group to build a hotel at Baross square, Budapest. The new player on the Hungarian market entrusted DVM group with the construction planning and the construction works of their hotel project in Budapest. This mandate is one of the largest instructions DVM group has won on the Hungarian market to date. Planning and preparations already started early November. The scheduled delivery date of the building is 2020. The design of the hotel façade and the apartment house was done by architect Gergely Fernezelyi.